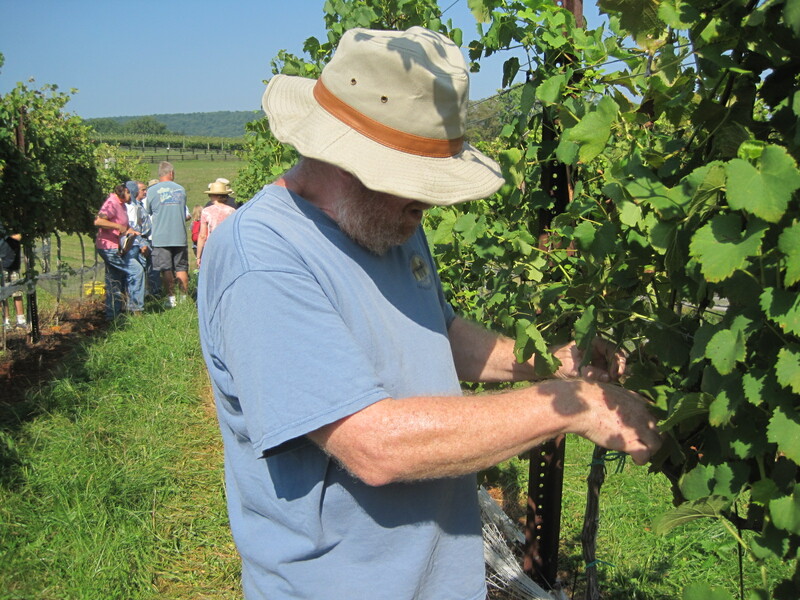 Since we don’t have grapes of our own to harvest this year, we did the next best thing, and took a class at Piedmont Virginia Community College on “Harvesting and Basic Analysis of the Must,” taught by the incomparable Gabriele Rausse. 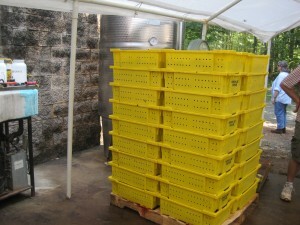 Each grape is precious – I don’t want to send bad fruit to the crush pad, but I don’t want to waste good fruit either. After a brief classroom lecture, we moved on to Blenheim Vineyards, where we helped (help being a relative term) pick one section of Viognier grapes. I went into this assuming that picking grapes might be the one thing about viticulture that would be so straightforward, so foolproof – SO SIMPLE! – that we could just do it, without staring at the vines, paralyzed with fear, before asking for help. 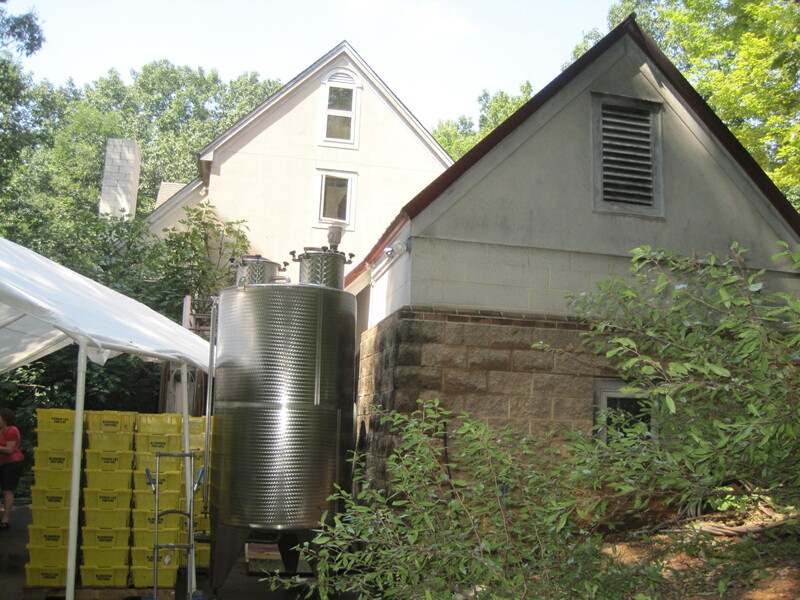 This has been an exceptionally difficult year for Virginia vineyards, and Blenheim didn’t want to take a chance on letting bad fruit infect the good back at the winery. So, in addition to sorting at the crushpad, Blenheim left bad fruit on the ground in the vineyard. 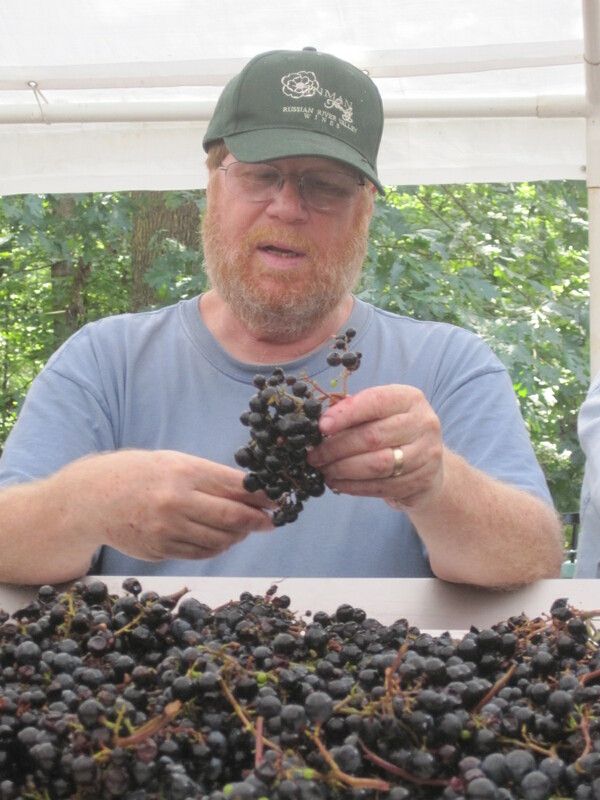 Here I am working at the sorting table, trying to sort and not scarf down these incredibly sweet grapes. Which meant that I ended up staring at the vines, examining each cluster in minute detail and wondering whether to add it to the lug or leave it on the ground. I didn’t want to send bad fruit back to the winery, but I also was worried about dropping good fruit to the ground, needlessly reducing the size of the harvest. Honest to God, I was almost at the point of worrying about each individual grape. Which meant that I ended up asked Gabriele for expert assistance on about every other cluster, at least at the beginning. By the end of that session, I was feeling more confident, and asking for help only about every fifth cluster or so. 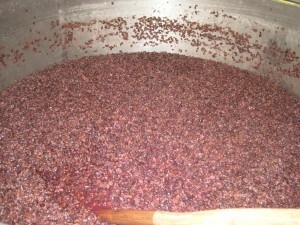 Pinot Noir, undergoing primary fermentation. The cap on top needs to be punched down at least twice a day. assembly line, that’s how I felt. The clusters of fruit moved down the conveyer belt, and we sorted as quickly as we could, but always with the feeling that we were falling behind. Fortunately, there were ten or so of us on the sorting table at any one time, five on each side, and so I think we did a pretty fair job. I tasted a few of the grapes as they passed by, and I couldn’t believe how sweet a perfectly ripe wine grape tastes. So much different from what I buy at the grocery store. What a lovely property – you can see the lugs of grapes bottom right, and a tank just above it. must will also include skins and perhaps some seeds and stems that didn’t filter out in the destemming process. 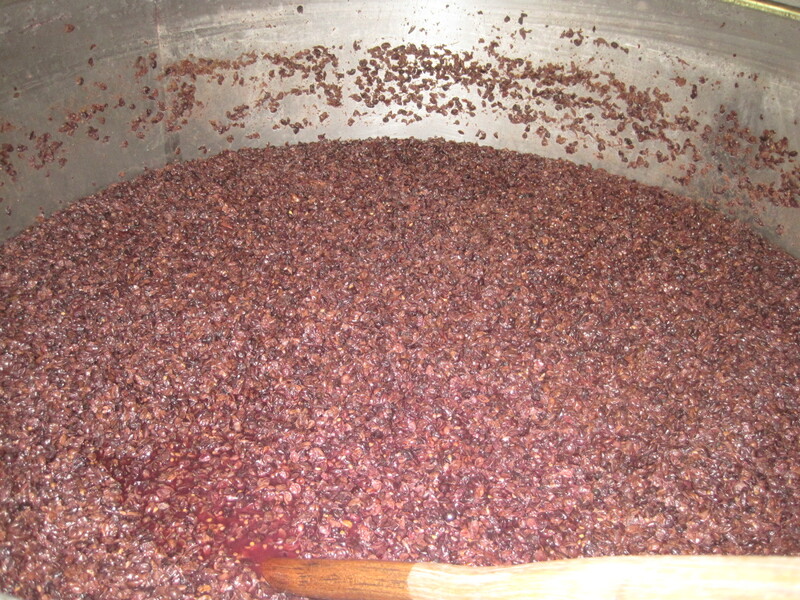 The skins add color to the red wine, as well as tannins and other qualities. And they create a huge amount of work for the winemaker, or at least for the cellar rats who do the work. The skins rise to the top of the must and must be “punched down” a couple of times each day. In a large fermentation tank, that can be a lot of work. But if you only have to do it once, as I did, it’s a fabulous experience! Gabriele had a Pinot Noir fermenting, and we all took turns climbing the ladder to the top of the tank and punching down the must. It was pretty cool to see the cap of skins floating on the top, and amazingly satisfying to punch it down. I suspect we all punched down the same skins over and over and that someone had to come along after us and do the job properly. But for a moment or two, I felt like a genuine cellar rat. Not bad, for a guy who works in an office all week. 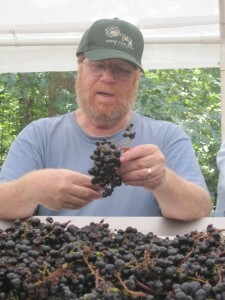 My parents had a concord grape vine in Michigan when I was a child. I moved to Nebraska 6 years ago and have yet to ever find concord grapes for sale anywhere. I want to grow my own concord grapes now. I have a towne home and want to grow them on my second story balcony. I have lots of room for it, but I don’t know where to begin. Is this a feasible idea? Can concord grapes be grown in a plant box as long as they have something to climb on? Very interesting question, and in all honesty, I don’t know the answer. My guess is that you would find it difficult for a couple of reasons. First, grape vines can get quite heavy, so you might need a lot of support. Second, the roots tend to go quite deep, so you may need quite a large planter. You’ll also want to be sure that the vines get adequate sun, and you’ll probably have to spray, which can be quite a challenge. You might want to contact some nurseries and ask them the question. 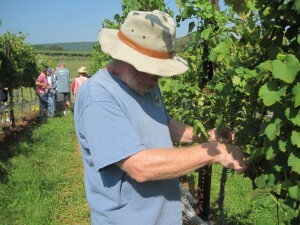 One that I have found to be quite helpful is Double A Vineyards in New York state. They sell Concord grapevines, and they are very nice about answering questions on the phone. Double A’s web site is at: http://www.doubleavineyards.com. Let me know what you decide. © 2019 Project Sunlight – A Winemaker's Education. All rights reserved. Premium WordPress Themes.